Major DAW manufacturers have good reason to fear the Reaper: it's a viable alternative with some distinct advantages. Quick to load. Very portable and light on resources. Extremely reasonable price. As deep as you like. Regularly updated. Still no audio editor. Very basic instrument suite. Quantisation options are primitive. Reaper handles audio and MIDI tracks in the same way. Released in 2006, the first version of Reaper was the ugly duckling of DAWs. MIDI functions were best described as basic, there was no audio editor, and it had a rather poor interface aesthetic. Subsequent versions have seen improvements on all fronts, and while there's still no built-in audio editor, pretty much every other aspect has improved enormously. So, before we look at the new features and enhancements, let's run over the basics for those who new to the software. Essentially, Reaper works along much the same lines as Cubase, Logic, etc, in that it uses a horizontal track-based approach to audio and MIDI sequencing. 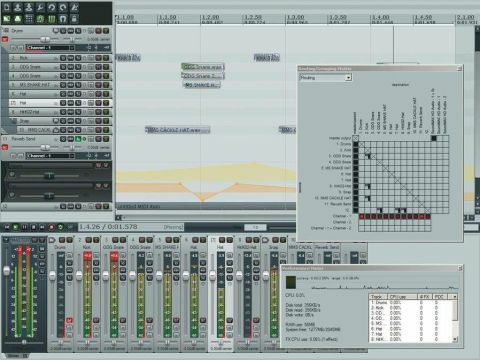 The software has a single main screen that includes the track view at the top, with an area at the bottom where the mixer and various other windows, such as the routing matrix and performance meter, can be docked. The track window also has its own slightly simplified version of the mixer and, here, buses can be set up using a track nesting system. All other graphical elements - such as track routing windows, plug-in interfaces, and so on - are displayed in separate floating windows. "Unlike most similar programs, Reaper loads incredibly quickly, so in just a few seconds you can go from the desktop to recording." So far, so ordinary, but Reaper has plenty of attributes that make it worth considering over more established offerings. For starters, it's got a very light system footprint - the installers for each format are only a few megabytes, and the software can even run from a USB stick. And unlike most similar programs, Reaper loads incredibly quickly, so in just a few seconds you can go from the desktop to recording. Another advantage of the software is its flexibility. Reaper has sophisticated audio and MIDI routing capabilities, plus its tracks can don't have to be assigned as either audio or MIDI - a single track type handles both, making it easy to set up audio effects that output or receive MIDI data, sidechain routing and so on. As the small installer size indicates, you don't exactly get a huge library of sounds to work with - the included instruments, aside from the useful but basic ReaSamplomatic 5000, are simplistic at best. The program does come with some decent effects in the form of the ReaPlugs FX suite, though, including delights like a sidechainable compressor and gate; multiband compression and EQ, each with as many bands as you like; an unlimited tap delay; and an FFT-based dynamics processor. These effects might not be packed with character, but for bread-and-butter processing, they certainly do a good job. Also included are literally dozens and dozens of effects created with Cockos' Jesusonic effects development environment (which comes with Reaper), enabling you to create and compile your own effects, or edit the included ones. Cockos has added tons of new features to Reaper since we reviewed v2 in 123 - far too many to even list - so we'll cover the most important here. The biggest change is that Reaper is cross-platform these days, and will run on PPC and Intel-based Macs, which increases the software's already impressive portability. Reaper really is an app that you can take anywhere and use on practically any system. Other important additions include élastique 2.0 algorithms for improved timestretching; transient-based beat-slicing; REX 2 file support; per-take volume, pan and mute envelopes; a parameter modulation system that employs audio levels or a built-in LFO; automation lanes; nested track folders; improved MIDI editing; and a more attractive interface. These new features go quite some way to ensuring that Reaper competes with its rivals, and in many respects it's a cutting-edge piece of music software. The routing and modulation features in particular could make owners of many other DAWs jealous, and the clever way in which the tracks work is both elegant and flexible. It's also worth noting that Reaper is about to get a whole lot more famous now that Harmonix, creators of the Rock Band videogame franchise, has announced a plan that will enable anyone to create Rock Band-playable content from their own tracks using a special Reaper-only add-on. Using this, you'll be able to produce a track in Reaper (or just import stems from any other DAW) and turn it into fully interactive Rock Band content. Finished tracks can be uploaded to the Rock Band Network (currently in testing phase, but scheduled to go live later this year). Once they've been vetted for copyright infringement and approved by the Rock Band community, they can be bought by other users for 80, 160 or 240 Microsoft points. "You'll soon be able to produce a track in Reaper (or just import stems from any other DAW) and turn it into fully interactive Rock Band content." As yet, there's no PS3 support for this system, and users will need an Xbox 360 and Rock Band 2 to test their tracks. Also, the uploading software, Magma, is currently Windows-only, though Intel Mac users can, of course, run it via Boot Camp. Rock Band Network is a very big deal that could potentially open the floodgates for a slew of user-generated game content, and its reliance on Reaper will certainly throw some welcome limelight on the software. On the downside, the editing of audio tracks and MIDI data isn't as sophisticated or slick-feeling as in, say, Cubase or Logic, and we could say the same of the included plug-ins. The lack of comprehensive quantise and groove options is another drawback, as is the continued absence of a built-in audio editor. However, the audio tracks themselves offer a useful degree of editing functionality, and it is of course possible to assign an external audio editor that will open automatically when an audio region is double-clicked. Despite its drawbacks, we're sure that many will find Reaper 3 to be their favourite DAW. It's a deep piece of software, and true mastery will depend on getting your teeth into the hefty 410-page manual and long list of keyboard shortcuts. The concentration on the latter, rather than convoluted menus, alongside its resource-efficiency and nonexistent copy-protection (you can install and run it on any machine - no dongles or codes necessary) make it the ideal DAW for music-making on the move. And even if you don't learn it inside out, it makes for an excellent musical sketchpad. Above all, Reaper is a thoughtfully-designed piece of software at a sensible price, and is definitely worth checking out, even if you're happy with your current DAW. And since the evaluation version is complete, fully functional and non-expiring, there's really no reason not to give it a go.